Is fighting comparable to blocking shots or taking a hit to make a play? The Detroit Red Wings will be without the services of Anthony Mantha for the next four to six weeks after the forward sustained a hand injury while fighting Colorado Avalanche defenseman Patrik Nemeth during Sunday's game. It was announced earlier today that Mantha will undergo surgery. However, the Red Wings aren't upset about it. MLive.com’s Ansar Khan reported today that Red Wings head coach Jeff Blashill certainly does not blame Mantha for his reaction as he came to the defense of his teammate Dylan Larkin, who had just absorbed a hard hit. Blashill went on to compare fighting to blocking shots or taking a hit to make a play. You can see the fight in the video above, atop this article. 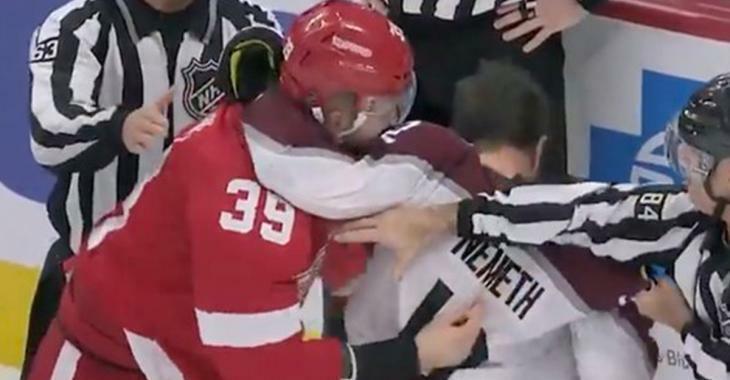 Sunday’s 2-0 loss to the Avalanche ended up being quite costly for the Red Wings, losing Mantha along with the game, however, it seems like no one in the dressing room is upset at the young Wings forward for making the decision to go after Nemeth. In 27 games this season, Mantha has registered nine goals and five assists for Detroit. It isn't the first time Mantha misses some action before he made the decision to drop the gloves and fight an opponent. Mantha’s 2016-17 season ended after he broke his finger in a March 2017 fight with Luke Witkowski, then with the Tampa Bay Lightning. Witkowski is now a current teammate of Mantha in Hockey Town and surely appreciates what he did on Sunday for Larkin.